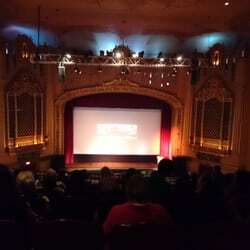 When it opened on August 6, 1926, the Golden State Theatre, seating 1600 people, was the largest theatre between San Francisco and Los Angeles, and could hold 25% of Monterey?? ?s population. It featured modern miracles that were cutting-edge for 1926: hidden lighting that imitated a colorful sunset; an electric seat annunciator system that helped the uniformed ushers seat patrons quickly and efficiently; an emergency generator; an electric central vacuum; and an internal/external telephone system. In October of 2004, volunteers and the community at large learned that Warren Dewey had purchased the theatre from Regal Entertainment Group. His plan to restore the theatre to its 1926 glory, making it once again a true performing arts center, has proceeded rapidly. And today the theater is once again a place of entertainment, taking its rightful place as a historical monument, enjoyed by the entire Monterey community.